Dyne Testing is fast becoming the most well recognised and trusted supplier of Dyne test pens and inks in the UK and overseas for countless applications throughout industry. Offering customers a choice of Dyne test solutions, Dyne Testing strive to provide first class, value for money products and services delivered by a great team of people who care. For optimum adhesion when printing, gluing or coating on various substrates, it is necessary to obtain a high surface energy. Low surface energy of polymer-based substrates often leads to poor adhesion of inks, glues and coatings. Determining the surface energy can be easily achieved by use of Surface Energy Test Pens and Inks (Dyne level testing). 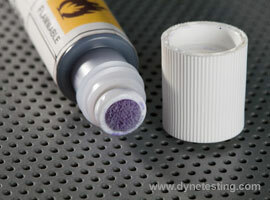 Dyne test fluids perform well on most non-absorbent materials. It is critical that the test fluid does not alter the surface properties of the substrate. For example, if the test fluid permeates a fibre substrate (e.g. paper) and causes swelling, results will indicate unrealistically easy wetting. A chemical reaction between the test fluid and the substrate invalidates results altogether. When the Dyne level test fluid is applied to the surface, the liquid will either form a continuous film on the surface or pull back into small droplets. If the Dyne test fluid remains as a film for 3 seconds, the substrate will have a minimum surface energy of that ink value, expressed in mN/m (Dynes). Should the Dyne test liquid reticulate or draw back into droplets in less than 1 second then the surface energy of the substrate is lower than that of the liquid itself. The exact surface energy (Dyne level) can be determined by applying a range of increasing or decreasing values of Dyne test fluid. The fluid contained within the Dyne pens supplied by Dyne Testing is based on the ISO 8296 method for measuring the surface energy of polyethylene film and offers the valve tip applicator type pen and not the “Felt Tip Pen” type which tend to produce too much fluid during testing and create possible inaccuracies. Dyne Testing offer a range of Dyne levels between 30 – 72mN/m supplied in either disposable pens or bottles of test fluids. Determining the surface energy can be easily achieved using Surface Energy Test Pens or Inks (Dyne level testing) or by contact angle measurement. Further information on these products can be found by visiting the product pages: Dyne Test Pens, Dyne Quick Test Pens, Dyne Test Inks, Drawdown Test Equipment, and Contact Angle Meters.